"I got the 8000BTU 12v version for my 26ft Glacier Bay. First of all I must say that customer service is outstanding!!! I first ordered the 24v and changed my mind at the last minute before they sent it out. They changed the system back to 12v and did not charge me a dime. I installed 2 X 6V battery bank at 225ah, which gave me 450ah total. This lasts me 4hrs with ac running at full power. I also installed a 12V 100 amp AC to DC Converter/charger. This allows me to hook it up to 110 volt while in my dock and have my ac running and to charge the battery bank. I also installed a 2000 Honda Generator on the roof. When I am going fishing the generator provides 110 volt of power to my converter/charger. Since it is 100 amps it powers the AC without draining my batteries. When in our fishing spot, I can turn off the generator and operate on my battery bank silently for at least 4hrs (did not try longer yet but after 4hrs, AC was still operating at full speed). The 8000BTU is fine for my upper cabin and lower deck. I installed 2 air vents. AC is installed under the bed in the lower cabin. The AC will not cool off this boat as does the AC in my house. Irealize that there is no insulation in this boat and the windows are thin as well. There is a lot of energy loss. However with the outside temperature at 85 F in Florida today, it cooled the top cabin down to 74 and the lower deck to 71 F. I think this is excellent!!!! Considering the humidity and sun we have outside, the temperature inside is comfortable. Make sure you install 15amp circuit breaker and 20amp wire inside your boat. The AC pulls 13 amps from 110 volts so with my set up when charging the batteries I had to connect it straight to the charger. After I changed the circuit breaker to 15 amps I could then just connect it to shore power outlet and have all charged at the same time. I can’t say enough how satisfied we are with this unit. It is very quiet; blower is powerful enough to support 2-3 outlets, cools down at least 11-15 deg. (I think I can get it cooler by installing new window tint and insulating my windows as I do have vids where hot air is entering the cabin). I recommend this AC unit to all my friends that have cabins. I also think the price of this is very reasonable considering the quality of the AC and the excellent customer service they give. They stand behind their product and were always available to answer questions I had. This is a 100% AMERICAN made product ! Not a cheap made import. Thank you Cruise N Comfort USA." I left the VES Air Conditioner from Cruise N Comfort on last night .... Big Mistake, lol !! ... 1972 Toyota Land Cruiser"
"I own a 53ft Endeavour Powercat which we keep in Stuart Florida. When I built the boat I had a DC Breeze air-conditioner installed in the Master Stateroom. 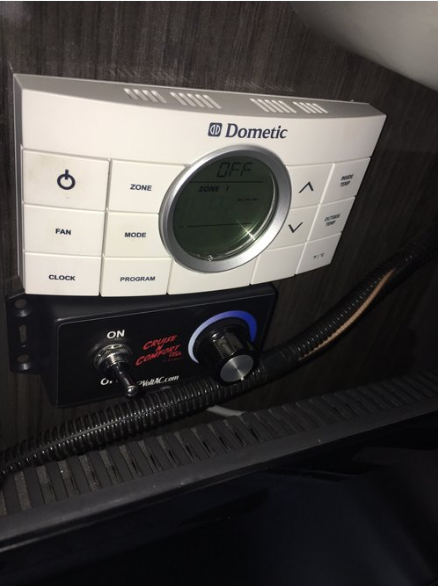 The Master Stateroom is huge and the 5000 BTU DC Breeze could not keep up, so this year I installed one of the new 12 series air-conditioners from Cruise n comfort to replace the DC Breeze. The new unit was the same size as the DC Breeze but put out 8000 BTU vs 5000 BTU. The results were dramatic. With water temperature of 80F and ambient of 84F the new unit cooled the stateroom to 70F in about 30 minutes. The 12V unit pulled 42amps during the cool down period. The old DC Breeze pulled 40 amps at 12V so 30% more cooling with essentially the same current. This unit is extremely well made and the performance is outstanding. I would highly recommend this product. Keeping in mind that this product will cycle on and off with a thermostat you will need to assume that it will draw about 20 amps continuous for power planning purposes. So overnight plan on using 200 amp hours. I have a 1000 amp hour battery bank and it handles it easily. Another tip. Bring your boat down to temperature using your AC air-conditioner and your generator if possible then go to bed and turn on the DC air-conditioner to keep the boat cool through the night. We do this at anchor all the time and it can reduce the current used to as little as 100 Amp hours even when it’s hot outside all night. Don’t let anyone tell you that DC air-conditioners are a waste of time as they are just flat out wrong. They are much more efficient than AC air- conditioners and the unit from Cruise N Comfort is the first DC air-conditioner that solves all of the old issues of the DC breeze type. I have no connection to Cruise N Comfort but I am an electrical engineer that appreciates a well designed elegant product. This is definitely the way to go if you don’t want to run your AC generator all night.
" Keeping my little guy trailer cool ! Works fantastic! "